According to Nielsen, Hispanic home ownership has been on the decline since 2007 - Fueled by chile, frijoles & tortillas. We received this news announcement under embargo from the folks at Nielsen. Between now and 2020, roughly four out of every 10 new households that form in the U.S. will be headed by someone of Hispanic descent – more than any other single racial or ethnic group. The Hispanic demographic will be a key driver of home rental and purchasing activity in the next several years, and this will have important implications for the housing sector. 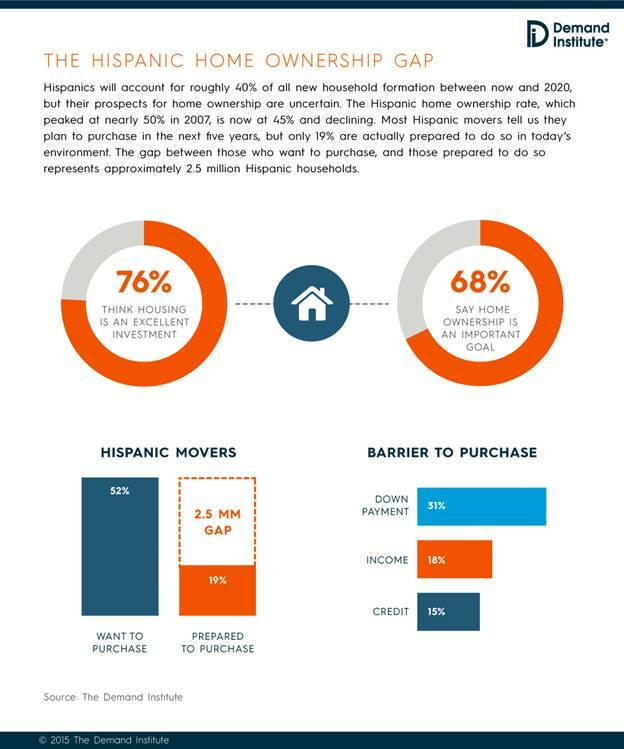 Hispanics aspire to home ownership, and the majority of Hispanic movers want to purchase when they move. But a new report from The Demand Institute finds that many Hispanic households will struggle to achieve the dream of home ownership in the next five years because they lack the down payment, income or credit to follow through on their plans. Hispanics & Home Ownership: Closing the Gap is the latest publication from The Demand Institute, a non-advocacy, non-profit think tank jointly operated by The Conference Board and Nielsen. The report finds that nearly four-million Hispanics would like to purchase a home when they move, but only 1.5 million are financially prepared to do so – a gap of 2.5 million households that will struggle to attain the goal of home ownership. In 2007, the Hispanic home ownership rate peaked at nearly 50 percent but has been in decline ever since. “Hispanics are one of the fastest-growing demographics, and their prospects for home ownership in a lot of ways reflect the prospects for the entire country,” continued Keely. The report also finds that more Hispanics are moving to the suburbs, even though Hispanics are still more likely than non-Hispanics to live in urban areas. “Hispanic households are still most likely to be family households,” said Jeremy Burbank, who is a vice president at The Demand Institute and leads the American Communities Demand Shifts Program. “Hispanics are moving to the suburbs for more space, better schools and more affordable housing – they’re looking for places to raise their families,” said Burbank. The Demand Institute illuminates how consumer demand is evolving around the world. We help government and business leaders align investments to where consumer demand is headed across industries, countries and markets. A non-advocacy, non-profit organization and a division of The Conference Board, The Demand Institute holds 501(c)(3) tax-exempt status in the United States and is jointly operated by The Conference Board and Nielsen. For more information, please visit demandinstitute.org. The Conference Board is a global, independent business membership and research association working in the public interest. Our mission is unique: To provide the world’s leading organizations with the practical knowledge they need to improve their performance and better serve society. The Conference Board is a non-advocacy, not-for-profit entity holding 501 (c)(3) tax-exempt status in the United States. For more information, visit conference-board.org.